This PBY-5A Catalina was purchased in 1994 from Avalon (Canada) and arrived in the Netherlands in May95 with tailnumber N27311. It started for Consolidated msn300 with delivery in 1941 to the US Navy as (Bu.No.) 2459, it was passed on to the US Coast Guard till Oct45. It operated for various civil operators and by Oct53 became registered to Transair as CF-HHR. Field Aviation took ownership in 1972 and was operated by Avalon Aviation from 1972-1987 as C-FHHR and by the end it was stored. 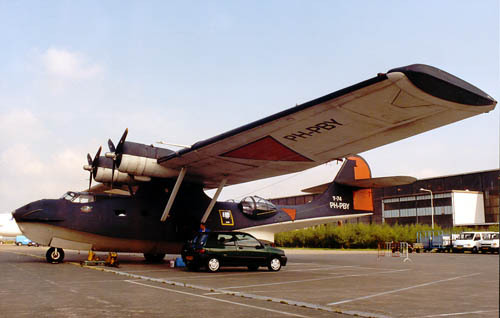 During Oct98 PH-PBY was stored at Schiphol-East (the maintenance area) and the blisters were removed. Catair was declared bankrupt. Hard times befell "Cat Air". Here seen during 2000, with the blisters removed. By that time it also became clear that the DDA would have to sell its DC-4 PH-DDS and the Invader was put up for sale in the US in 2001. It's sad to see tiredless efforts and initiatives to preserve the "Industrial Heritage" of the Dutch aviation scene come to an end; a lot has to do with a very restrictive attitude by the Dutch aviation authorities (but imagination and vision is not a virtue one would expect or associate with burocrats anyway, now would you ?). The Cat was bought by the Stichting (=Foundation) Neptune Association and on 11may99 transferred to Valkenburg Naval Air Base. 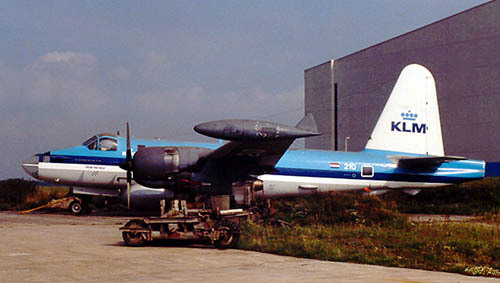 By that time it was hoped that it would be operational again in 2000, but by Nov2002 the aircraft was still being restored (props in overhaul at Coventry, ailerons by Aviodome at Lelystad, paintstripping for future respray by QAPS at Schiphol, etc.). 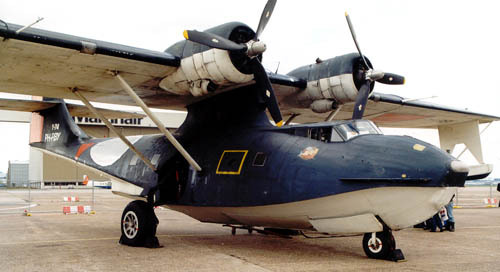 I have dedicated a page, PH-PBY, to the restoration (2004) and active years of 'De Stichting Exploitatie Catalina' in the Netherlands. A-26C 44-35710 (c/n 28989) 'Hard to Get' of Robert Nivo is seen here being towed for a display with the DDA on 07Mar99. It was operated by owner Richard Nivo of the Historic Invader Aviation, after being delivered on 15Aug98. During 1998 it had been restored to original bomber configuration from executive transport by Aero Trader in Chino,CA. It is a partial restoration of an executive conversion. Although the A-26 looks externally complete, it lacks a bomb bay, including the doors. It has an executive interior, which starts right behind the cockpit all the way to the rear gunner's compartment. The rear gunner's compartment still includes the sighting mechanism for the top and bottom remote turrets. Aad van der Voet, fellow propliner enthusiast, reported in Sep.2007 this Invader was still for sale and stored at Rockford,IL. 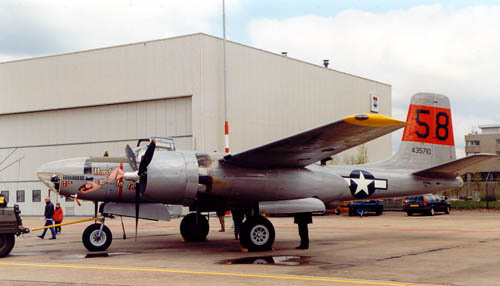 It was finally sold during Nov.2007 to the Cavanaugh Flight Museum in Texas. Gerben Groothuis sent my a 2011 photo, follow THIS LINK! 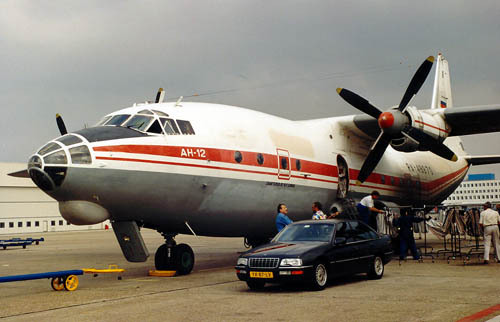 Shorts SC-5 Belfast G-BEPS (c/n SH-1822) at Schiphol, probably early-1990s. The Royal Air Force once operated it as XR365. This Lockheed P-2 Neptune was used as an instructional airframe and was hardly ever taken out of the hangar; the KLM colourscheme looks of course very weird on this aircraft ! Former Royal Netherlands Navy (Marine Luchtvaart Dienst-MLD) 210/V, it was donated to KLM in Dec83 for use as an instructional airframe and was resprayed in KLM c/s during 1985. I photographed it on a rare outing in Aug98. This SP-2H is a converted (glazed-nose) P-2H. This aircraft was moved on 20mar01 to the former Fokker hangar. KLM Apprentice Training School merged with NLC (=Ned. Luchtvaart College, = Netherlands Aviation College) and apparently this airframe was no longer of use. The Neptune has earned its fame as a Navy patrol plane and is powered by 2 Wright R-3350-32W Turbo Compound radials with 2 additional Westinghouse J34-WE-36 jet engines, giving it a topspeed of 403 mph and a range of 5930 kms (3680 mls). Anyone with a cruising speed ? This Neptune found its way to the Aviodrome to be restorated. While I don't know the operator (Vitair ?) of the Antonov An-12 UR-11819, it's a welcome visitor from the Ukraine. The Antonov An-12 is propelled by 4 Ivchenko AI-20K (4000hp) turboprops and is capable of a cruising speed of 580 kmh (360 mph) over a range of 3400 kms (2113 mls). < Five Bulgarian Air Carries Banned from Flying in EU, 23 February 2007 >. "Five Bulgarian air companies will no more carry out flights in the EU, Switzerland, Norway and Iceland, the state air administration decided on Thursday. The five companies are Air Sofia, Helli Air, Prite Aviation, Scorpion Air and Vega Airlines. The court sitting of European Agency for Aviation Safety, which is to end Thursday, will have to decide whether the Bulgarian air carries to be included in the "black list" of the European Union." When the "Iron Curtain" was removed and the Soviet Union opened up, one of the most beautiful aircraft emerged (in my humble opninion..): the Antonov An-12 ! Here RA-48970 is unloading garments, stored on shopping racks, straight from the aircraft into a truck. Flights such as these were were handled on the "lower budget" cargo ramp at Schiphol-East (the maintenance area). This shot was taken in 1994 or 1995. Later, cargo ramps were added at Schiphol-Center, such as the Romeo- and Sierra-ramps and flights like these were handled there and cargo moved thru warehouses. The Antonov An-22 must be the most impressive propellor transport ! It's seen here between the big jets, while getting a pushback for departure. 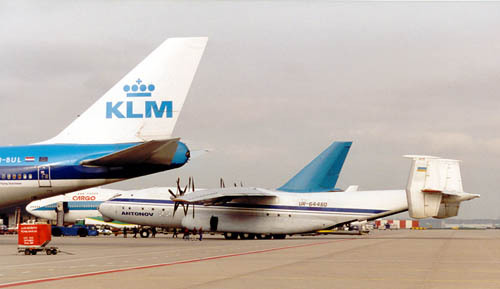 It's UR-64460 from the Ukraine and a rare visitor to Amsterdam in 1998. 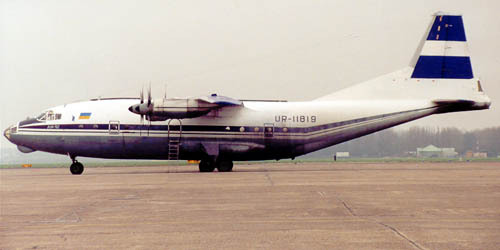 The An-22 was built with heavy and outsize cargo in mind; it's capable of hauling 80Tons, the same as present-day McDonnell-Douglas MD-11s can carry. First flight was in 1965 and this giant resembles the Antonov An-12, just bigger ! The 4 Kuznetsov NK-12MA turboprops are capable of a topspeed of 740 kmh (460 mph) and the range would be 5000 kms (3100 mls) with max.payload or 10950 kms (6790 mls) with a 45 tons load. The An-22 was designed with both use by Aeroflot as well as the Russian Air Force in mind. 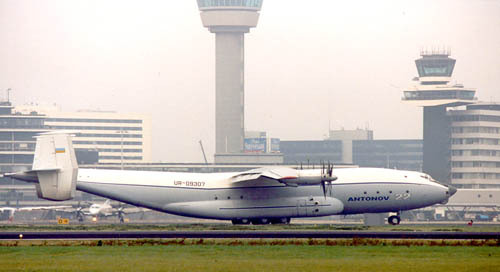 On another ocasion it was Antonov An-22 UR-09307 (c/n 043481244) paying a visit to Amsterdam in the winter of 1997/98. It's operated by Antonov Airlines, which is a division of the Antonov Design Bureau and are based at Kiev-Gostomel, Ukraine. This An-22 "Antheus" arrived with the Speyer museum in Germany on 29dec99 for preservation; it was bought for $ 200.000 from the ADB. The Lockheed Hercules is definitely one of my favourite aircraft ! Here is N923SJ (c/n 4301) at Amsterdam in 1997. Southern Air Transport used to have links with the CIA for covert operations. Southern Air Transport was formed in 1947 flying freight with a Curtiss C-46 Commandos to the Caribbean from Miami. Scheduled freight flights to the Virgin Islands were also flown using Douglas DC-3s. Later Douglas DC-6 aircraft were introduced for new services to Colombia and Venezuela. 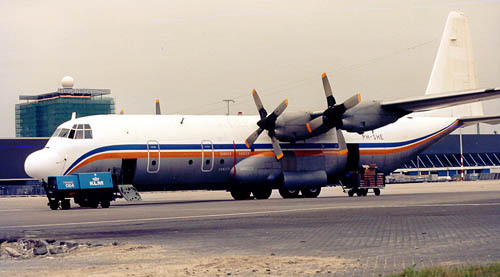 By the mid 1960s Lockheed L382G Hercules freighters were in use and had replaced the older types. Later jets such as Boeing 707s, McDonnell DC-8s and Boeing 747s were operated. This aircraft was bought by Transamerica Airlines at some point, again later reregistered S9-CAV and as such been operating with Transafrik Int'l since 1998 from Luanda, Angola. Transafrik is a large Hercules operator, having 12 of these in its fleet (2002). 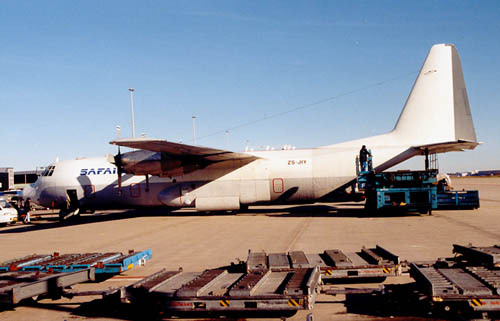 This Safair L-100-30 ZS-JIY (c/n 4691) is another "Herc" operating for KLM Cargo; the ramp is cluttered with dollies while the aircraft is being loaded; again, taken somewhere in the winter of 1998. It was still operating in 2002 with Safair of Johannesburg, S.Africa. 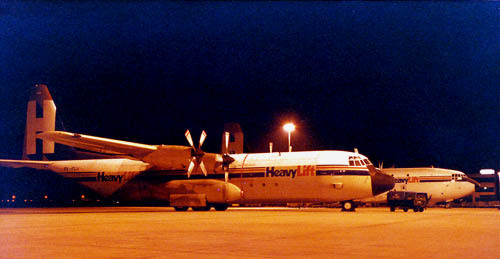 Safair operates 8 Hercules aircraft (2002). The Lockheed Hercules has 4 Allison T56 turboprops, which give it a range range (with 15876 kg of payload) 3360 km (2083 mls) and a cruising speed of 528 km/h (327 mph). Sometimes I sneaked outside and made the effort of a night shot. 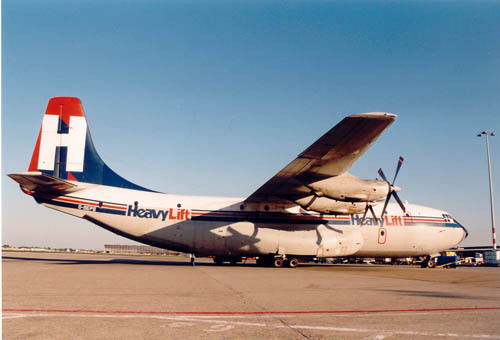 In 1996 HeavyLift leased a Lockheed Hercules (PK-PLU, c/n 4824) from Pelitta Airways (Indonesia) for the KLM cargo feeder services and this photo was taken in 1996. This aircraft was, at some unknown date, reregistered A-1329 for the Indonesian Air Force and crashed on 20Dec2001: at Malikussaleh Airport it overshot the runway and collided with the airport perimeter fence and burst into flames (no fatalities). 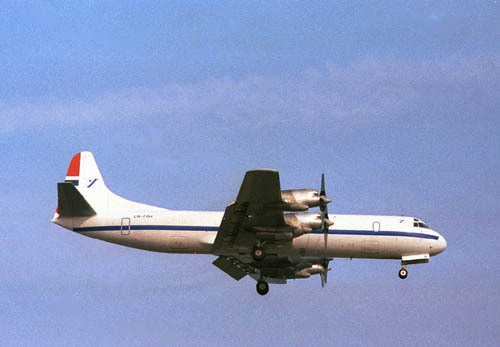 Early 1990 Schreiner Airways used a Lockheed L-100-30 Hercules (PH-SHE, c/n 4895) for a contract with KLM, to feed cargo to and from Amsterdam for KLM. The contract lasted only till August that year, as the Hercules proved to be a liability to the schedules. Flights were done mostly at night. Before and after her lease to Schreiner/KLM it was registered in Gabon as TR-KKD (Force Aérienne Gabonaise). I do not know what became of this aircraft or where it is now. EuroDirect was a company that started operating from Bournemouth in 1994, but folded again in 1995. BAe ATP G-OEDE (c/n 2033) is seen here on one of the remote ramps of Amsterdam's Schiphol. 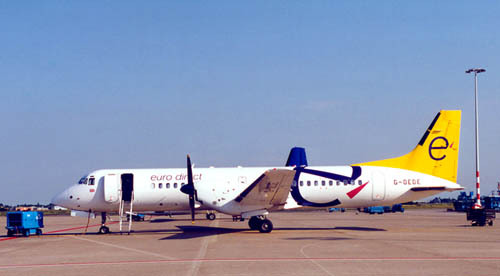 ATR-72 G-UKTJ is seen here in unfinished Air UK c/s in 1998. Air UK was previously known as Air Anglia (which was formed after a merger of three small east Anglian air companies - Norfolk Airways, Anglian Air Charter and Rig-Air - in July 1970. Operations were started from Anglia's Norwich Airport on an ad-hoc charter basis. When at the end of 1971 the airline opened a third scheduled route it was a daily service from Norwich to Amsterdam. By 1978 Air Anglia had been purchased by a shipping company which also owned several other compatible regional airlines. On 16Jan80 Air Anglia was merged with these other airlines (three other domestic carriers, British Island Airways - BIA , Air Wales and Air Westward) to form Air UK. In 1987 a 14.9% stake was acquired by KLM, which was increased to 45% in 1995 and 100% in 1997. In 1998 the name Air UK was changed to KLM uk. KLM uk is a joint venture between KLM and Air UK (which is 100% owned by KLM). The aircraft (consisting of a mixture of the two airlines' aircraft) are flown in basic KLM livery with the title 'KLM uk'. 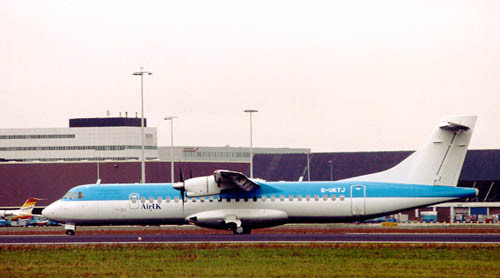 The fleet consists of: Fokker F.50s, F.100s, BAe146s and ATR-42s. Destinations are mainly in Holland and the United Kindom. 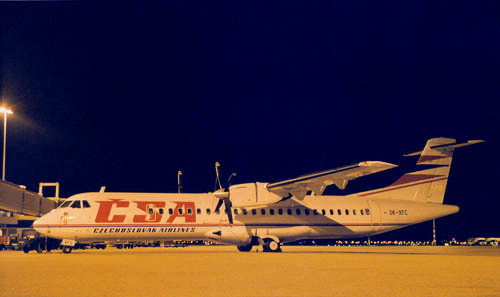 Another nightshot: here is an ATR-72 of Czechoslovak Airlines (OK-XFC) in 1992 (I think), when these republics were still one country. They split up in 1993. "Coastguard 01" is PH-MNZ. It is in maintenance and logistics support by Martinair, which has a long tradition with this governmental contract, dating back to the 1970s with the Cessna's PH-MAZ and PH-MPC. Photo taken in 1999. The support by Martinair ended in March 2003. 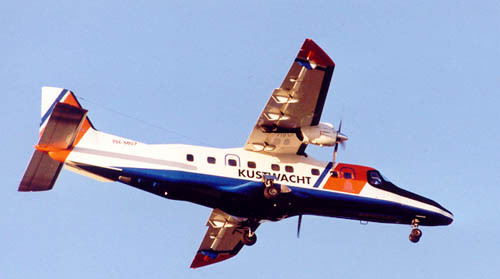 The Dornier Do.228 has been in production since mid-1980s and sold well due to its versatility: feeder services for airlines, military use, coastal patrols, air ambulance, etc. It was in licence-production in India and in China. The 2 Allied Signal (Garrett AiResearch) TPE331-5-252D turboprops give it a topspeed of 440 km/h (273 mph) and a range of 1740 kms (1079 mls). The cabin is not pressurized. L.188 LN-FOH is seen here in approach into SPL, april 1996. This Lockheed Electra c/n 1145 was manufactured in 1961. It operated under several identities: N9746C (Western Airlines from Feb61 till Aug72), CF-IJJ, N5767, N9746C, LN-MOI, LN-FOH and is currently (2002) operating with Amerer Air in Linz,Austria as OE-ILA (since Sep97). The prototype of the Electra was first flown in 1957 and was the first turboprop airliner designed and built in the USA. The 4 reliable Allison 501-D13A turboprops (3750hp) delivered a cruising speed of 600 kmh (373 mph) and a range of 4458 kms (2770 mls). Fred Olsen's Electra LN-FOI is seen here awaiting cargo; their flights to and from Amsterdam were feeder services for KLM. This Lockheed L.188CF Electra was manufactured in 1959 and assigned tailnumber N9724C; it was sold to Tasman Empire Airways in 1959 and registered as ZK-TEA (after initially ZK-BMP was not taken up), which changed to Air New Zealand in 1965. Via California Airmotive Corp.(1972 N31231), Flamingo Airlines (1972 N31231), California Airmotive Corp.(1972 N31231), she ended up with Fred Olsens Flyselskap on 11Sep73. 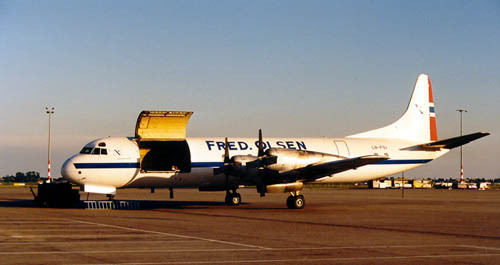 After being founded in 1933, Fred Olsen decided in 1997 to shut down his airline operations: it had become to expensive to operate these aircraft. All aircraft were stored and offered for sale in 1997. LN-FOI was stored at Coventry with Air Atlantique/Atlantic Airlines. This airframe was sold to a US-broker World Aviationn Services in in1999, tailnumber N31231 was reserved but not taken up. During 2002 it appeared that the airframe suffered from severe corrosion and deemed irrepairable. It will probably be scrapped for spares for the fleet of Atlantic Airlines.